Sometimes an electric shaver just can’t get around the edges needed to trim a mustache, or to trim a long beard effectively. 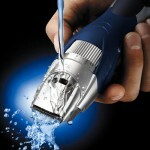 The Panasonic ER-GB40-S is a cordless and rechargeable beard trimmer that can be used wet or dry. 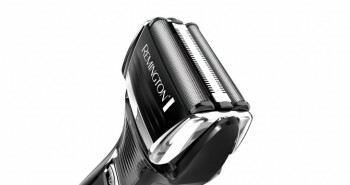 It has nineteen adjustable settings, so you can truly customize your shave. At home grooming has become easier, instead of needing to visit the barber shop every few weeks. You’ll enjoy the convenience of this cordless shaver. 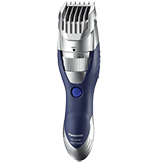 The Panasonic trimmer comes in a slim blue and silvery-grey design, with an easy to grip recessed handle, making it easier to clutch in the shower. It has a rubberized grip, to avoid dropping and damaging your new trimmer. It’s a cordless trimmer that can be used to tackle beards. It can quickly be adjusted to any of the nineteen settings. This precision cutter is made from stainless steel, and is hypo-allergenic. The blades in the Panasonic trimmer are fast action. 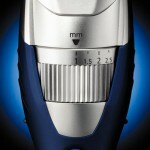 The precision blades are at a 45 degree angle, to enable a superior trim. This is the best angle for trimming beard, hair, and mustache. The blades cut quickly, and cleanly, requiring fewer passes. 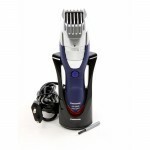 The trimmer can make short work of the thickest, densest, and most unruly hairs. It has unique water shutters that enable for fast and easy maintenance. It’s simple to clean your trimmer after using. It’s 100% washable. It has an open water drainer. Open it up, then simply rinse under warm running water, to get any stray whiskers out. Shake out the excess, pat dry with a towel, close the water drainer, and let air dry. You can even use shaving gels, lotions, foams, and creams with your trimmer. If you do so, be sure to rinse out your trimmer after each use, so it doesn’t get gunked up with product. The trimmer still works perfectly when dry too. It’s up to you. If you pack it into your bag to do a touch up for an important date or meeting, its portability will help you out. You can even pack it for travel. If you’re going away for just a short trip, you can simply charge it up in advance, and it will be ready to go. No need to pack the charger unit too. You’ll save yourself space in your luggage. Each of the nineteen settings are based on what length of hair you wish to leave behind on your face. The 19 settings vary from 1 to 10 millimeters. There are 0.5 milllimeter incremental adjustments. You can get as close to the skin as possible, or leave your beard with a rugged look. To use the different settings, there is an adjustable dial to choose your 1 to 10 millimeters. You can simply rotate it up or down, to choose your desired length of trim. The Panasonic trimmer is fully rechargeable, so you can save money from having to buy expensive double or triple A batteries. 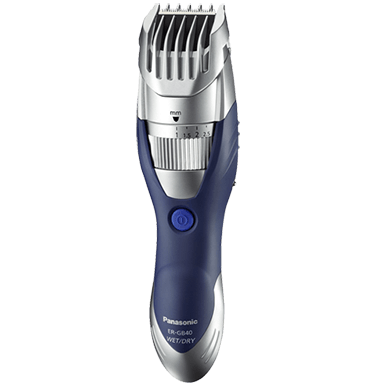 The Panasonic trimmer is quite affordable, so if you need a second trimmer, in addition to your electric shaver, you won’t have to pay a ton of money for your second unit. Inside the box is the trimmer, an AC recharger stand with visual indicator light, three comb attachments, and a cleaning brush. The trimmer weighs 12.8 ounces, and measures 6.7 x 1.8 x 1.8 inches. When the trimmer is charging, it neatly stows into the stand. The LED light will illuminate in red at the base, so you know when it is charging, and when it is done. You can also store your trimmer in the stand when not in use, to keep it from being damaged. 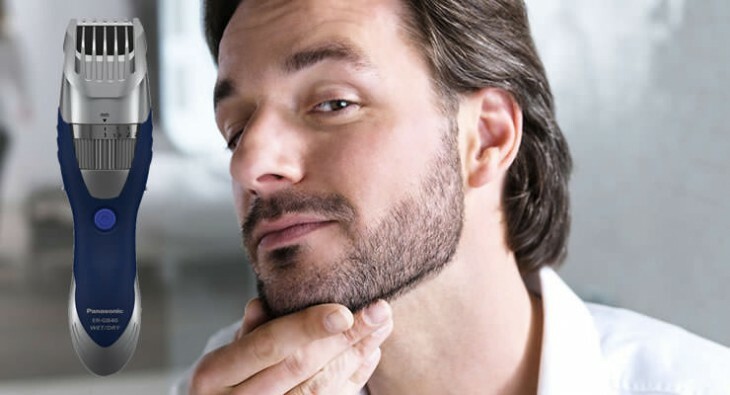 It can be annoying have to buy multiple shavers to get the job done, but sometimes a regular cordless shaver can get around all the corners and sharp angles of a face. For men who want to look flawless, the Panasonic ER-GB40-S trimmer is an affordable trimmer that can get into those spaces that a regular shaver can’t. You really can’t go wrong with buying this trimmer, and it’s backed by the well-known Panasonic brand warranty.